Judd Kinzley. 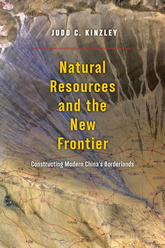 Natural Resources and the New Frontier: Constructing Modern China’s Borderlands. University of Chicago Press, 2018. China’s westernmost province of Xinjiang has experienced escalating cycles of violence, interethnic strife, and state repression since the 1990s. In their search for the roots of these growing tensions, scholars have tended to focus on ethnic clashes and political disputes. In Natural Resources and the New Frontier, historian Judd C. Kinzley takes a different approach—one that works from the ground up to explore the infrastructural and material foundation of state power in the region. As Kinzley argues, Xinjiang’s role in producing various natural resources for regional powers has been an important but largely overlooked factor in fueling unrest. He carefully traces the buildup to this unstable situation over the course of the twentieth century by focusing on the shifting priorities of Chinese, Soviet, and provincial officials regarding the production of various resources, including gold, furs, and oil among others. Through his archival work, Kinzley offers a new way of viewing Xinjiang that will shape the conversation about this important region and offer a model for understanding the development of other frontier zones in China as well as across the global south.